20th annual powwow celebrates Native American culture, traditions. All are invited to attend the free event taking place from noon to 9 p.m. Jan. 19 at PCC Sylvania campus. Portland Community College is celebrating the Native American culture and traditions with its 20th-annual powwow at the Sylvania campus. 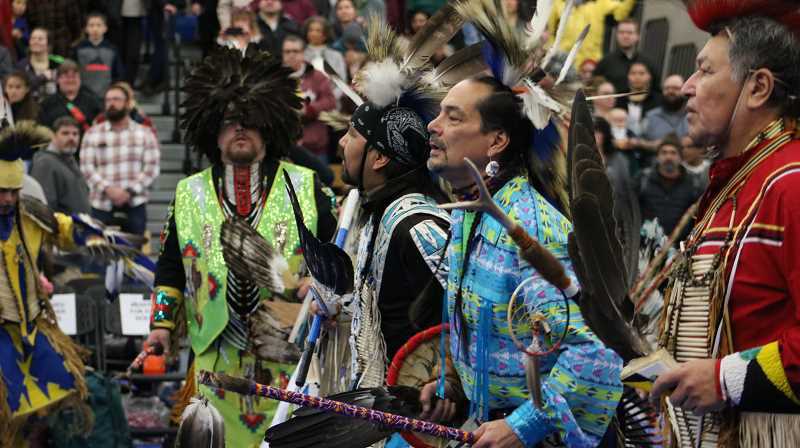 The Wacipi (They Dance) Traditional Powwow will be held from noon to 9 p.m. Jan. 19 in the gymnasium in the Health Technology Building (HT). Honored guests include master of ceremonies Bob Tom, from the Confederated Tribes of Siletz and Grand Ronde, whip man Carlos Calica, from the Confederated Tribes of Siletz, co-host drums Sitting Horse and Starhorse, and head dancers Ed and Vicki Wulf. "The powwow gives us all a chance to recognize our indigenous communities that exist both on and off campus," said Mak Porotesano, who is the coordinator of the Sylvania Multicultural Center. "Portland has the ninth-largest urban native population in the country; we want to do our part to celebrate and honor our native community at PCC and the indigenous people of these lands." This year's event will include grand entries at 1 and 7 p.m., and a free community dinner at 5:30 p.m. There will be a drum group, dancers, crafts, food, activities for children, a college fair and raffle prizes. Money raised from the event benefits PCC's Native American Scholarship Fund and vendor space provided by the college helps local Native American businesses. "All the money collected at the event will go directly to that fund through the PCC Foundation," Porotesano said. "The direct contributions of scholarship funds are supporting our desire to support and graduate students from our Native communities. We have a lot of work to do with our indigenous peoples and students, but this is a great place to start." The Winter Powwow is sponsored by Sylvania campus President Lisa Avery, the PCC Powwow Planning Committee, Sylvania campus multicultural and women's resource centers and the Native American Youth and Family Center. Admission and parking to the powwow are free. this the event you don't want to miss." For more information visit pcc.edu/powwow or call 971-722-4116.